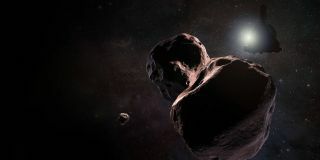 Artist’s impression of NASA’s New Horizons spacecraft encountering 2014 MU69, a Kuiper Belt object that orbits one billion miles (1.6 billion kilometers) beyond Pluto, on Jan. 1, 2019. The countdown to New Horizons' historic second flyby has now begun in earnest. The NASA spacecraft, which famously zoomed past Pluto in July 2015, is set to cruise by a small object called 2014 MU69 less than 12 months from now — in the wee hours of Jan. 1, 2019, while many of us will be drinking Champagne and singing "Auld Lang Syne." 2014 MU69 is a pristine hunk of icy material left over from the solar system's planet-building epoch. Like Pluto, MU69 lies in the Kuiper Belt, the ring of icy bodies beyond Neptune's orbit. But the two objects are very different: MU69 is a maximum of 20 miles (32 kilometers) wide, whereas Pluto measures 1,477 miles (2,377 km) across. MU69's small size and extreme distance from Earth — about 4 billion miles (6.4 billion km) — make it difficult to study. Even that rough size estimate was hard-won — the result of New Horizons team members traveling the globe to observe three separate "occultations" of background stars by MU69. The occultation data also suggest that MU69 may actually be two separate objects, and that it might have at least one moon — but nobody knows for sure. "That tells us this object is going to have a lot of surprises in store for New Horizons," occultation campaign leader Marc Buie, also from SwRI, said in the same statement. Timeline of New Horizons operations leading up to and just after the New Year’s 2019 encounter with Kuiper Belt object 2014 MU69. During the Jan. 1 flyby, New Horizons will get within just 2,175 miles (3,500 km) of MU69's mysterious surface — about three times closer than it got to Pluto in July 2015. This proximity will enable the spacecraft to resolve features on MU69 as small as a basketball court, NASA officials said. "Combining images with the measurements we make of the composition of and environment around MU69 should teach us a great deal about objects like MU69 that built dwarf planets like Pluto," said New Horizons project scientist Hal Weaver, of the Johns Hopkins Applied Physics Laboratory (APL) in Laurel, Maryland. New Horizons has been in hibernation since Dec. 22. The mission team will wake the probe on June 4, then perform a series of checks to make sure it's ready for the MU69 encounter, which officially begins in mid-August with some attempts at long-range observations. The 2014 MU69 flyby is the heart of New Horizons' extended mission, which also features long-distance observations of about two dozen other Kuiper Belt objects and study of the gas and dust pervading this far-flung region. "This post-Pluto mission is a complete and comprehensive exploration of the Kuiper Belt," said APL's Alice Bowman, New Horizons mission operations manager. "The spacecraft is collecting data out there throughout each year while the mission team works together to plan and shape the MU69 flyby."